We offer a great selection of coin and currency to choose from. To learn more visit the manufacturer websites below. 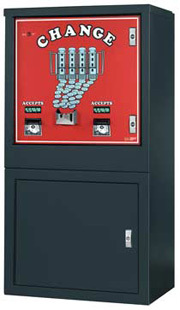 This high capacity, dual validator, floor model machine is very versatile and is well suited for any Vending, Amusement or Laundry application. This front load model is available with either a "Change" or "Tokens" front and can hold up to 20,000 coins. 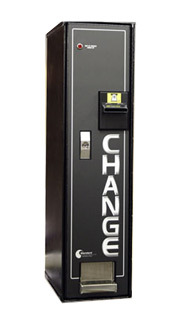 The MC100 is a versatile machine that can be used in vending break rooms providing change for snack, soda and coffee machines, or it can be mounted on the wall of a small on-premise laundry room in an apartment complex or college dormatory. The single steel coin hopper will hold up to 3,200 quarters ($800 capacity). 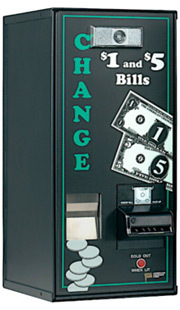 The MEI CASHFLOW VNR Recycler accepts $1, $5, $10 and $20 bills, and stores either $1 or $5 bills for use as change for future purchases. 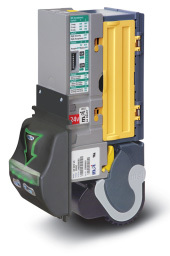 Modular in design, the VNR module can be added at any time to VN2700 bill validators. The VNR module simply snaps into the rear of the validator.